The ZeeLung MABR cassette being installed at the O’Brien Water Reclamation Plant. Close-up of GE’s ZeeLung membrane cord. Video: The Metropolitan Water Reclamation District of Greater Chicago demonstration project of ZeeLung MABR technology. Energy neutrality is the ability to reduce energy consumption while increasing energy production to the point that a facility produces as much or more energy than it consumes. This is increasingly important since water and wastewater treatment typically accounts for 35% of a municipality’s energy budget. 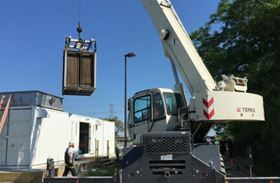 The demonstration project at O'Brien Water Reclamation Plant in Skokie, Illinois, aims to prove ZeeLung’s ability to remove nutrients in the plant’s existing footprint and reduce the energy required for biological aeration by 40%. ZeeLung is a gas-transfer membrane, which transfers oxygen by diffusion to a biofilm that grows on the outside surface of the membrane. The microorganisms in the biofilm remove nutrients and organics in the wastewater by metabolising them in the presence of oxygen. The result is a four times reduction in energy compared to conventional fine bubble aeration systems in use today. In June 2015, the MWRD and GE commissioned a demonstration of one ZeeLung MABR cassette at the O'Brien Water Reclamation Plant to prove the concept works. The district will then consider whether to install the technology in the full-scale plant, one of the largest sewage treatment facilities in the United States. Facing the need to meet more stringent regulations for phosphorus removal in the future, the MWRD was motivated to evaluate ZeeLung as a means to implement biological phosphorus removal in its existing bioreactors and without the need for chemical addition. Modeling has shown that at full scale, ZeeLung has the potential to help the MWRD improve the O'Brien facility’s performance under stressed conditions, specifically cold temperature peak events. Furthermore, these benefits come with the potential energy savings of 40% over the existing fine bubble aeration system. “The energy costs for the O'Brien Water Reclamation Plant are $5 million per year," reports Commissioner Mariyana Spyropolous, president of the MWRD Board of Commissioners. The O'Brien Water Reclamation Plant serves more than 1.3 million people residing in a 141-square-mile area, which includes the city of Chicago, north of Fullerton Avenue, and the northern Cook County suburbs. It removes pollutants from wastewater through primary clarification and conventional activated sludge and has a design capacity of 333 million gallons per day.